Making sure your hands stay clean, and free of illness-causing bacteria or viruses, is one of the best things you can do to keep yourself healthy. 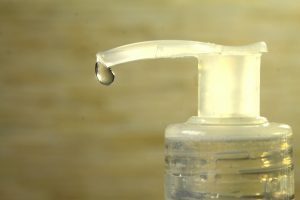 The most effective way of achieving this goal, according to the CDC and other medical authorities, is to simply wash your hands with regular soap and water, since antibacterial soaps have not been proven to be more effective at preventing illness. But let’s be honest, sometimes washing our hands with soap and water is impractical, annoying, or just not possible, and this is where hand sanitizers have been a huge game changer. In a hospital setting, hand sanitizers are of crucial importance for ensuring that illnesses aren’t spread, but outside of that kind of environment, there are a few reasons why I choose to not use commercial disinfectants. In fact, I’ve also written an article sharing why we don’t use commercial disinfectants in our home. The main active ingredients in common hand sanitizers are alcohol and water. The rest of the ingredients are additives to make it the right consistency and smell, as well as to make it last longer. But these other ingredients have not yet been fully tested, and some have been linked to hormone disruption, skin irritation, and other toxic effects. Personally, I also hate the scent added to commercial sanitizers, especially the sweet kinds like vanilla or cookie dough- eating a burger with hands that smell like alcohol and artificial cookie dough can totally ruin a meal. 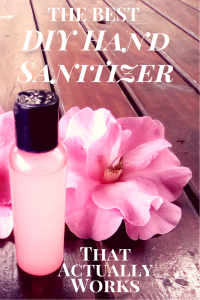 This simple DIY hand sanitizer uses the same main active ingredients as commercial ones to ensure efficacy, except it leaves out those questionable additional ingredients and overpowering smells. Bring the water to a boil; once it has reached this point, add in the agar agar powder. This powder only dissolves at high temperatures, so make sure the water stays very hot while mixing it in. Once it is fully dissolved, let it cool for no more than 3-4 minutes (otherwise it will gel too quickly), then add in the alcohol and essential oils. Transfer the mixture into a squeeze container and let it cool in the fridge for about an hour to let it gel properly. After that, you can keep it anywhere else at room temperature for your convenience. Many essential oils have some antibacterial properties of their own, so anyone you prefer will be fine. *Alcohol may be drying for skin, so to add moisture, you could add 1 tablespoon of vegetable glycerine to this recipe. Otherwise, you could substitute all the water with equal measures of aloe vera gel. Here in Italy aloe vera is super expensive, so I have been experimenting with other natural gels (like agar agar), that actually have work out wonderfully.